I am late getting to this, but Mark Thoma wants to hear the case for nominal GDP targeting. This approach to monetary policy requires the Fed stabilize the growth path for total current dollar spending. As an advocate of nominal GDP level targeting, I am more than happy to respond to Mark's request. I will focus my response on what I see as its three most appealing aspects: (1) it provides a simple and intuitive approach to monetary policy, (2) it focuses monetary policy on that over which it has meaningful influence, and (3) its simplicity makes it easier to implement than other popular alternatives. Let's consider each point in turn. (1) It provides a simple and intuitive approach to monetary policy. This first point can be illustrated by considering the following scenario. Imagine the U.S. economy is humming along at its full potential. Suddenly a large negative shock, say a housing bust, hits the economy. This development leads to a decline in expectations of current and future economic activity. As a result, asset prices decline, financial conditions deteriorate, and there is a rush for liquidity. The rise in demand for liquidity means less spending by households and firms and thus, less total current dollar spending in the U.S. economy. Because prices do not adjust instantly, this drop in nominal spending causes a decline in real economic activity too. Thus, even though the primal cause of the decline in the real economy was the housing bust, the proximate cause was the drop in total current dollar spending. The Fed cannot undo the housing bust, but it can prevent the drop in total current dollar spending by providing enough liquidity to offset the spike in liquidity demand. If nominal spending has not been stabilized then the Fed has failed to do this. A nominal GDP target, then, is simply a mandate for the Fed to stabilize total current dollar spending. (2) It focuses monetary policy on that over which it has meaningful influence. There are two types of shocks that buffet the economy: aggregate supply (AS) shocks and aggregate demand (AD) shocks. A nominal GDP targeting rule only responds to AD shocks. It ignores AS shocks while keeping total current dollar spending growing at a stable rate. This is the way it should be. For if monetary policy attempts to offset AS shocks it will tend to increase macroeconomic volatility rather than reduce it. For example, let's say Y2K actually turned out to be hugely disruptive for a prolonged period. This negative AS shock would reduce output and increase prices. A true inflation targeting central bank would have to respond to this negative AS shock by tightening monetary policy, further constricting the economy. A nominal GDP targeting central bank would not face this dilemma. It would simply keep nominal spending stable. In general, any kind of price stability objective for a central bank is bound to be problematic because price level changes can come from either AD or AS shocks and are hard to discern. For example, was the low U.S. inflation in 2003 the result of a weakened economy (a negative AD shock) or robust productivity gains (a positive AS shock)? It makes much more sense to focus on the underlying economic shocks themselves rather than a symptom of them (i.e. price level changes). Nominal GDP targeting does that by focusing just on AD shocks. This point is graphically illustrated here using the AD-AS model. More discussion on this point can be found here. (3) Its simplicity makes it easier to implement than other popular alternatives. This is true on many front. 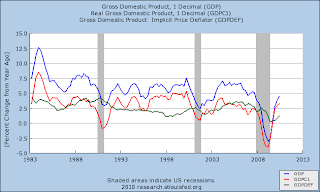 First, a nominal GDP target requires only a measure of the current dollar value of the economy. It does not require knowledge of the proper inflation measure, inflation target, output gap measure, the neutral federal fund rate, coefficient weights, and other elusive information that are required for inflation targeting and the Taylor Rule. There will always be debate on which form of the above measures is appropriate. For example, should the Fed go with the CPI or PCE, the headline inflation measure or the core, the CBO's output gap or their own internal estimate, the original Taylor Rule or the Glenn Rudebush version, etc.? A nominal GDP target avoids all of these debates. Second, nominal GDP targeting would also be easier to implement because it is easy to understand. The public can comprehend the notion of stabilizing total current dollar spending. It is less clear they understand output gaps, core inflation, the neutral federal funds rate, and other esoteric elements now used in monetary policy. The Fed would have a far easier time explaining itself to congress and the public if it followed a nominal GDP target. On the flip side, this increased understanding by the public would make the Fed more accountable for its failures. Third, a nominal GDP target would take the focus off of inflation and what its appropriate value should be. Thus, if there needed to be some catch-up inflation and nominal spending to get nominal GDP back to its targeted growth path the Fed could do it with less political pressure. Some folks argue that the nominal GDP targeting is nothing more than just a special case of a Taylor Rule. Maybe so, but they miss the bigger point that nominal GDP targeting is a far easier approach to implement for the reasons laid out above. Moreover, in practice the Fed has deviated from the Taylor Rule and during these times it appears to be more of a pure inflation targeter. Thus, adopting an explicit nominal GDP target would force the Fed to stick to stabilizing nominal spending at all times. Ultimately, I would like to see the Fed adopt not only a nominal GDP level target, but a forward-looking one that targeted nominal GDP futures market. This is an idea that Scott Sumner and Bill Woolsey have been promoting for some time. See here and here for more on this proposal. I don’t see how the mechanism advocated for actually hitting the NGDP target works. The crucial phrases in explaining how it all works seem to be thus. 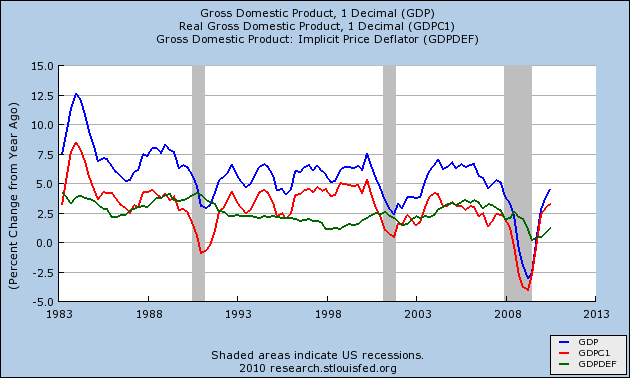 So if I’ve got it right, the monetary base is altered so as to alter GDP. Well now, the US had an ASTRONOMIC and UNPRECEDENTED increase in the monetary base at the second half of 2008 with little effect. Second, and on theoretical grounds, those people in a position to acquire big chunks of monetary base, i.e. the rich, won’t go on a spending spree just because of that transaction. Feed monetary base into the pockets of underwater households – now that would be a different matter. Also, Scott Sumner then says “And this problem could be especially severe in a liquidity trap. In my view, this problem could be mostly eliminated through a penalty rate on excess reserves.” My answer to that is that if potential holders of monetary base know they’ll be charged a “penalty”, they’ll just refuse to convert their assets to monetary base. That's because there was a big increase in the demand to hold money at least partially due to the Fed's starting to pay interest on reserves. Also, there is always *some* price at which people would be willing to exchange their assets for money. Beckworth does't emphasize this but the only way such a shock can become a problem is if it leads to people wanting to hold more money (and the Fed not accommodating them). If the demand to hold money is unchanged because of a change in the interest on reserves even though the demand to hold other assets has increased, well that's a solution to the problem as well (though not necessarily the best possible solution). "There are two types of shocks that buffet the economy: aggregate supply (AS) shocks and aggregate demand (AD) shocks. A nominal GDP targeting rule only responds to AD shocks." "For example, let's say Y2K actually turned out to be hugely disruptive for a prolonged period. This negative AS shock would reduce output and increase prices." "Nominal GDP targeting does that by focusing just on AD shocks." So, you are saying do nothing for a positive AS shock? Is that correct? I do not have anything against targeting nominal GDP, but I fail to see how it would make much difference. For example as it became obvious that the economy was in trouble in 2007 -08 the Fed cut fed funds from 5.25% in July 2007 to 2.0% in July 2008. Can you show me what would have been different if they had been targeting nominal GDP. What would the decision makers have known under nominal GDP targeting that they did not know and react to under the current system? "There are two types of shocks that buffet the economy: aggregate supply (AS) shocks and aggregate demand (AD) shocks." Technically, isn't there 4 types? positive AS, negative AS, positive AD, and negative AD? Jsalvati, The bulk of the reserve increase took place before the “interest on reserves” policy was implemented, according to Wiki. Plus the actual interest 0.25%, does not sound to me like a big incentive to hold reserves. Also, wasn’t this big increase in the monetary base due to the Fed buying up sundry assets (particularly from banks), rather than an increased “demand” for money? This is a superb post. I especially agree with your thoughts on the agonies of properly measuring inflation, about which whole studies and books have been written. I suspect we are actually overcounting inflation now, due to constant evolution in private markets to cheaper and better. It seems as if the econ profession is slowly gravitating towards NGDP. NGDP offers also the advantage that if we can successfully stimulate the economy monetarily, and maintain steday growth, it will reduce demands for stimulative, and debt-inducing, federal spending. "NGDP offers also the advantage that if we can successfully stimulate the economy monetarily, and maintain steday growth, it will reduce demands for stimulative, and debt-inducing, federal spending." By monetarily, do you mean more private debt (specifically middle and lower class debt) instead of gov't debt? That is real what counts in any economy. Not nominal. Nominal targeting would require huge and volatile balance sheet and therefore huge risks to capital which are fiscal by nature.